Detectives from Lancaster Sheriff’s Station are seeking the public’s assistance in identifying the below pictured suspects who are wanted for breaking into a vehicle and stealing items. First suspect is described as a Male Hispanic adult approximately 5’11 and weighs 180 lbs. 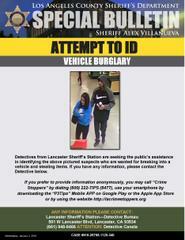 The second suspect is described as a Female Hispanic adult approximately 5’05 and weighs 140 lbs. Anyone with information regarding the identity of these two suspects is asked to contact Detective Canela at Lancaster Sheriff Station by calling 661-948-8466. If you prefer to provide information anonymously, you may call "Crime Stoppers" by dialing (800) 222-TIPS (8477), use your smartphone by downloading the “P3 Tips” MOBILE APP, “P3 Mobile” for the hearing impaired on Google play or the Apple App Store, or by using the website http://lacrimestoppers.org.